A colourful lighting scheme can add a wonderful burst of energy to a small home interior. The collision of various tones, contrasts and hues sparks off the synapses in the brain and tends to make most of us feel more inspired and happier. But how can you infuse your home with a colourful vibe without making it look messy or overdone? After all, we know how easily a small space can feel overwhelming when it's decorated with lots of strong elements. Well, here at homify we have lots of inspiring small homes bursting with colour. There's plenty here to get you inspired. So let's get going with exploring 10 of the most colourful little interiors! 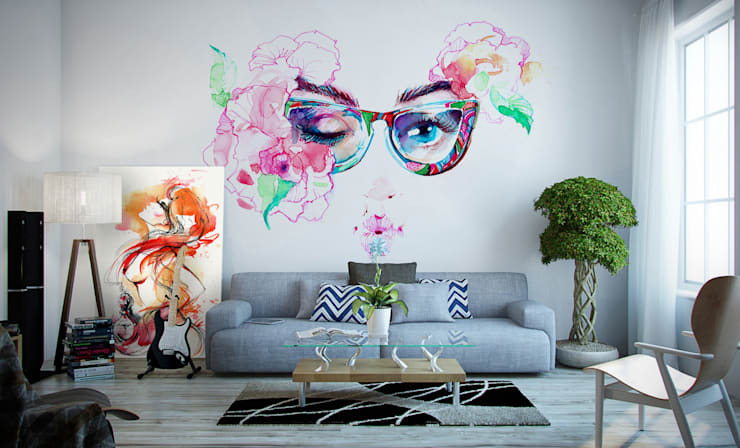 A piece of large wall art, wallpaper or frieze is a really good way to add colour to a little home. Some of these options are good for those in a rental home too. This home comes to us courtesy of interior designers and decorators Pixers. Red is a fiery home and certainly a daring choice for a living room. Here, it's been softened by the addition of a large, soft grey feature wall and lots of white elements. 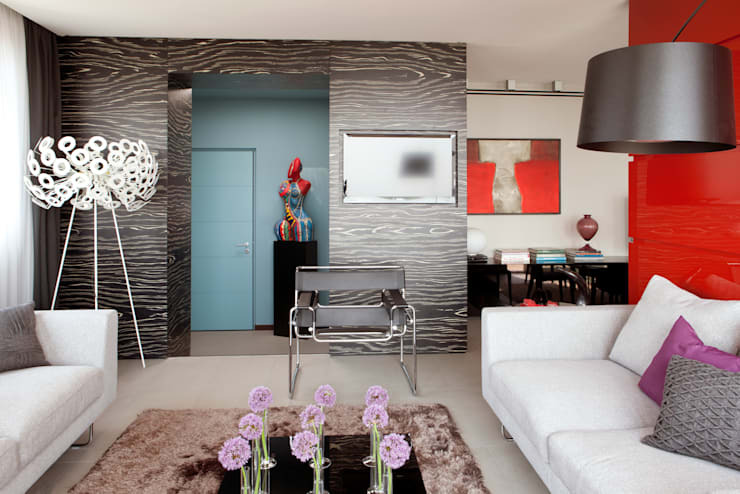 The contemporary lines in the grey wall and white lamp really draw attention and counteract all that fiery power too. Nothing quite sets off a bright colour like a black base. This awesome little black kitchen has just about the most stylish seats we've ever seen. It works really well with the bright yellow splashback as well. African art and design is renowned for its energy and vibrancy. 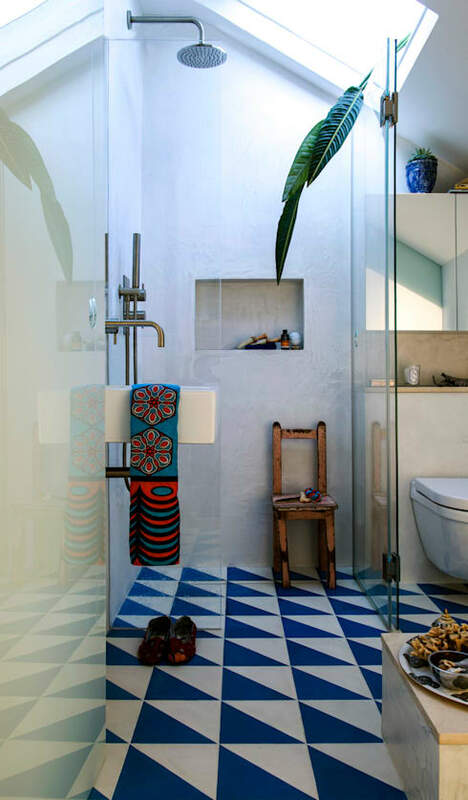 In this small bathroom we have blue and white bathroom tiles with a startling geometric design. This is definitely a good way to integrate white into a bright colour scheme. 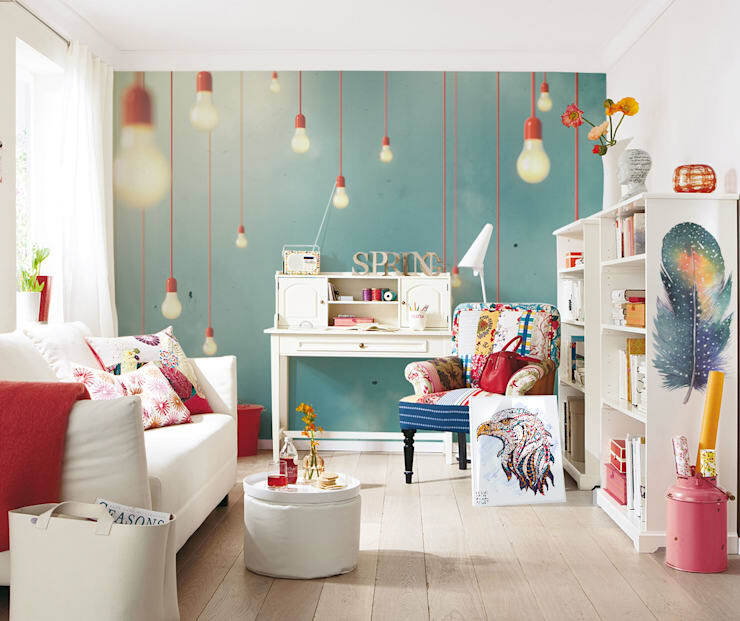 This playful little living room has a beautifully upbeat feel. The wall frieze creates a visual illusion that adds a lot of depth to the room too. Check out the super colourful furnishings and decorations. Big bold colours can easily feel a little too much in a small home. But here we can see how the spacious a room can feel with a free flowing design without obvious edges or borders. 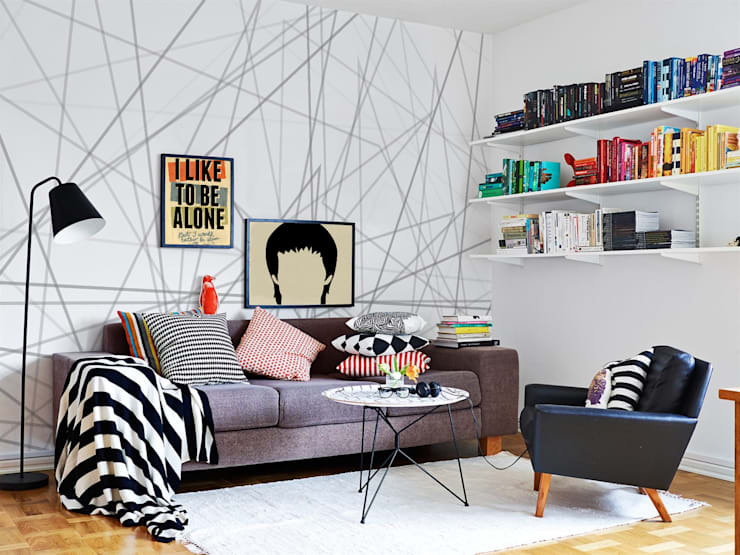 The wandering lines really add a lot of movement to this small white living room too. 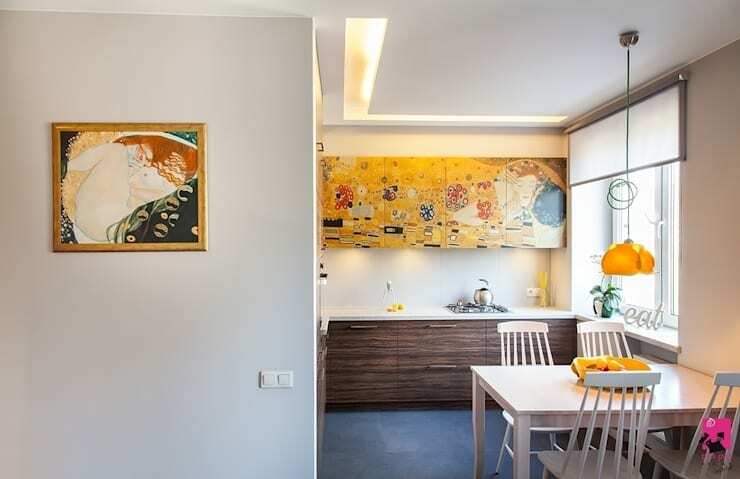 This little home has a kitchen inspired by the artist Gustav Klimt. 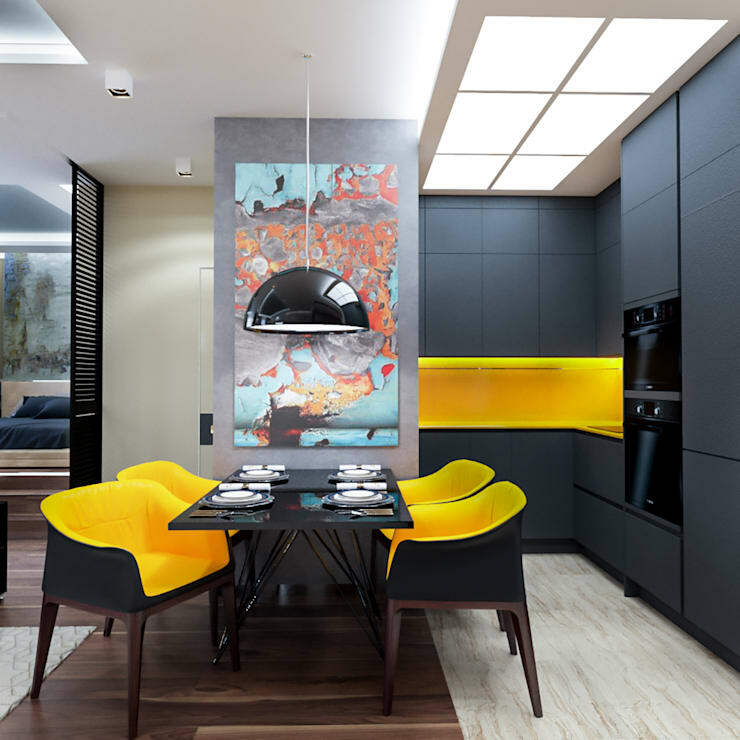 The yellow colour scheme is continued in little yellow pendant light. On the foreground wall we even have a framed artwork by Klimt too. 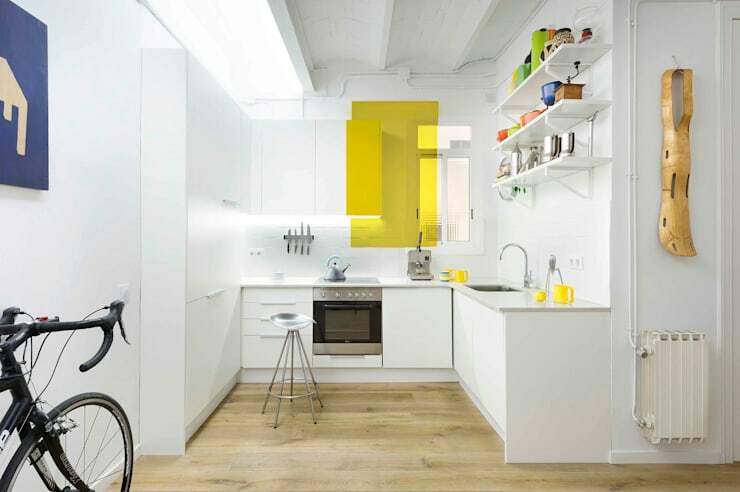 This totally unique little colourful home has a happy burst of canary yellow in the kitchen. We just love how it's been added in a really unusual way. It may seem random, but the shape has been carefully selected to mirror the shape of the window and white kitchen cupboards. Energetic colours can be amped up a few levels with a glossy finish. 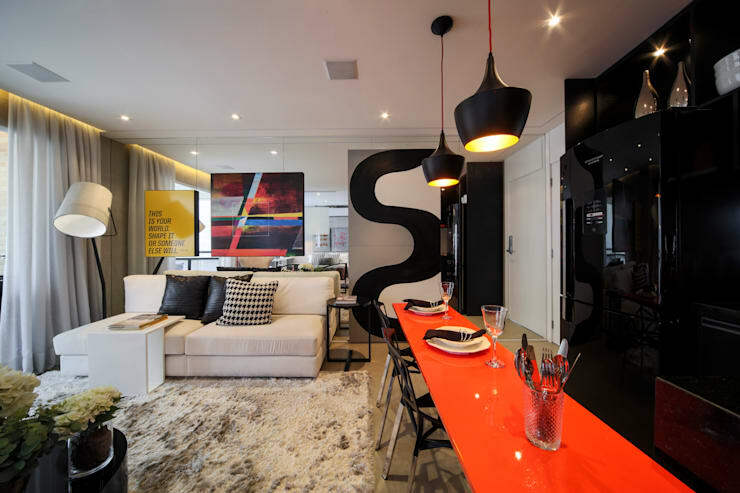 This glossy red and black kitchen has a really strong contemporary ambience. Note how the power of the bright kitchen has been softened by the use of a mirrored wall and neutral colours in the living room on the left. Lots of people are naturally wary of adding super bright colours to the walls and floors. Perhaps this little living room will present an inspiring alternative. The bright energy is introduced through the brightly colour coded arrangement of books on the wall. For more wall ideas, check out 8 creative walls you'll want in your home. Have you fallen in love with any of these little colourful homes?